Today the church remembers The Dorchester Chaplains: Lieutenant George Fox, Lieutenant Alexander D. Goode, Lieutenant Clark V. Poling and Lieutenant John P. Washington, 1943. February 3 is “Four Chaplains Day” in America by unanimous act of Congress in 1988. Unfortunately, it is generally not taught to the children in the schools, observed by governmental bodies, nor reported on by media. Consequently, the truly inspiring story of the Four Chaplains, who they are and why there is a day honoring them is unknown by most Americans. 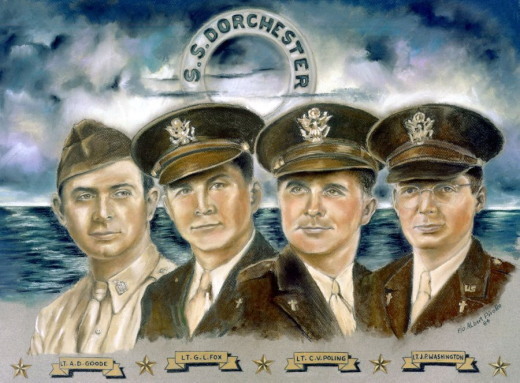 The Four Chaplains, also sometimes referred to as the "Immortal Chaplains" or the "Dorchester Chaplains", were four United States Army chaplains who gave their lives to save other civilian and military personnel as the troop ship S.S. Dorchester sank on February 3, 1943, during World War II. They helped other soldiers board lifeboats and gave up their own life jackets when the supply ran out. The chaplains joined arms, said prayers, and sang hymns as they went down with the ship. The relatively new chaplains all held the rank of first lieutenant. They included Methodist minister the Reverend George L. Fox, Reform Rabbi Alexander D. Goode (Ph.D.), Roman Catholic priest Father John P. Washington, and Reformed Church in America minister the Reverend Clark V. Poling. Their backgrounds, personalities, and denominations were different, although Goode, Poling and Washington had all served as leaders in the Boy Scouts of America. They met at the Army Chaplains School at Harvard University, where they prepared for assignments in the European theater, sailing on board Dorchester to report to their new assignments. The Dorchester had been a 5,649 ton civilian liner, 368 feet long with a 52-foot beam and a single funnel, originally built in 1926 by Newport News Shipbuilding and Dry Dock Company, for the Merchants and Miners Line, operating ships from Baltimore to Florida, carrying both freight and passengers. It was the third of four liners being built for the Line. Designed for 314 civilian passengers and 90 crew, she was able to carry slightly more than 900 military passengers and crew. Dorchester left New York on January 23, 1943, en route to Greenland, carrying the four chaplains and approximately 900 others, as part of a convoy of three ships (SG-19 convoy). Most of the military personnel were not told the ship's ultimate destination. The convoy was escorted by Coast Guard Cutters Tampa, Escanaba, and Comanche. Early on the morning of February 3, 1943, the Dorchester was wallowing through icy seas off Greenland. Most of the 900 troops on board were asleep in their bunks. Suddenly a torpedo smashed into the Dorchester’s flank. The troops milled in confusion on the decks. In those dark moments of panic, the coolest men aboard were four U.S. Army Chaplains: First Lts. Clark V. Poling, Alexander D. Goode, John P. Washington, George L. Fox. The four chaplains led the men into boxes of life jackets, passed them out to the soldiers with boat-frill precision. When the boxes were empty, the four chaplains quietly slipped off their own precious life preservers, put them on four young GIs and told them to jump. The Dorchester went down 25 minutes later in a rumble of steam. Some 600 men were lost, but the heroic chaplains had helped save over 200. The last anyone saw of them, they were standing on the slanting deck, their arms linked in prayer to the one God they all served. Far away in North Africa, Dr. Daniel A. Poling, distinguished American clergyman and father of Chaplain Clark Poling, was crouching in a foxhole when he learned of the heroic death of his son and his three fellow Chaplains. In his mind was born the idea of a shrine in the memory of this noble sacrifice; a shrine where people of all faiths could worship God in a spirit of unity without the need of uniformity. In 1988, February 3 was established by a unanimous act of Congress as an annual "Four Chaplains Day." Some state or city officials commemorate the day with official proclamations, sometimes including the order that flags fly at half-mast in memory of the fallen chaplains. In some cases, official proclamations establish observances at other times: for example, North Dakota legislation requests that the Governor issue an annual proclamation establishing the first Sunday in February as "Four Chaplains Sunday." The day is also observed as a feast day on the liturgical calendar of the Episcopal Church in the United States of America. Holy God, you inspired the Dorchester chaplains to be models of steadfast sacrificial love in a tragic and terrifying time: Help us to follow their example, that their courageous ministry may inspire chaplains and all who serve, to recognize your presence in the midst of peril; through Jesus Christ our Savior, who lives and reigns with you and the Holy Spirit, one God, for ever and ever. Amen.